Storm sewers are widely used to carry away runoff from storms, primarily in urban areas. The hydraulic design begins after the locations for the manholes for the system have been determined. Between each pair of manholes the storm sewer will have a constant slope and diameter. The hydraulic design process results in determination of an appropriate diameter and slope for each length of storm sewer and determines the depth of the bottom of the pipe at each manhole. The overall procedure and each step are presented and discussed in this course. Example calculations for a single length of storm sewer between two manholes will be performed and an example of calculations between successive manholes will be done using Excel. Be able to determine the value for runoff coefficient for a drainage area with known land use, SCS soil group, and approximate surface slope. Be able to find the rainfall intensity for specified storm duration and return period at a specified location if given an I-D-F table or graph for that location. Be able to estimate the overland flow travel time for a drainage area using the Manning Kinetic Equation. Be able to estimate channel flow travel time using Manning’s Open Channel Flow Equation. Be able to estimate peak runoff rate from a drainage area using the Rational Method. Be able to use Method I and Method II as outlined in this course to calculate design diameter and slope for a length of storm sewer between two successive manholes. Be able to determine the velocity and flow rate in a circular pipe flowing partially full if enough information is available to calculate the full pipe velocity and flow rate. Be able to put together the above skills to carry out the overall hydraulic design of a length of storm sewer between two successive manholes. 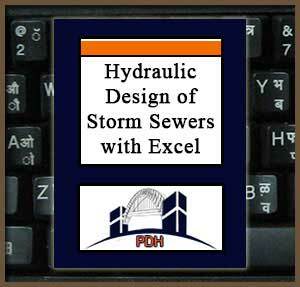 Be able to use Excel to make storm sewer hydraulic design calculations for lengths of storm sewer between successive manholes.